The IITF - India International Trade Fair,is a shopper’s & foodie paradise. A regular event every year, held in November. The India International Trade Fair or IITF for short, is eagerly awaited by the public at large who arrive in droves for the shopping offers, dances, food and just to be there. The IITF is though a traffic nightmare for those uninterested. It is to the credit of the organisers who over the years have perfected the art of pulling the India International Trade fair off without a hitch. This one is a manna from heaven for shoppers and Delhites take to it with vengeance. Many shop as if a drought was round the corner!!! Jokes apart, it does offer a panoramic view of the entire country. The focus point small artisans, small businesses, Government organizations, women’s co-operatives, SHGs and more…the products a veritable range and the prices quite moderate. Even established business –the medium to large descend offering value for money offers each which makes the inveterate shopper drool. The foreign participants also bring along their wares which is truly remarkable. Pakistan is a permanent fixture with their range in Onyx (it is truly to die for), the embroidered fabrics and of course the tribal embroideries and antique textiles. Afghanistan revels in its turquoise, jade and beautiful embroideries – Khamak, Uzbek dowry items. I have been the most partial to this pavilion, saving up much in advance for the splurge and of course coming back unsatisfied with glazed eyes of what I had to leave behind being short of cash! Good they don’t accept credit cards there!!! Afghanistan also offers saffron, dry fruits and pomegranate. Indonesia, Burma are loaded with jewellery. The Indian pavilions of various States are filled with their particular offering. It is an ideal place to source handicrafts, handloom item (Kantha, Sujni, Kutchi embroidery, woolens from HP, bamboo from North Eastern states….). Most importantly it is a good place to buy organic products and naturally grown agro products – Litchi from Bihar, Maharashtra, exotic fruit juices from North East, Uttaranchal, Honey from Jharkhand, Chattisgarh, Turmeric, spices from Kerala, North East…. The list is endless. In the agro packaging segment one does come across good products for franchisee deals. The women’s co-operative products ranging from Amla candies to indigenous chips & pappads are good no less. The buy one get two free routines, incense sticks replete with good overnight bags, bangles, bamboo boards, arecnut tree plates…. Food is another hot hot item. It is ideal to taste the authentic flavours of regional cuisine – be it the ubiquitous channa bhatura, dal makhni, dosa vada sambhar to the uncommon sattu, ragi rotis, pasarathu, Awadhi cuisine, Kahwa… street food – tikki, gol guppa, papadi, Chinese food to paneer tikkas…. The variety of fruit juices, coconut water (Kerala! ), banana, banana chips….. Location – At Pragati Maidan – November 14th – November 27th of every year. The tickets are available at Metro stations, Mother Diary booths and at the gate. Timings – Open all days, morning 10:00 am onwards. Check with advertisements for entry fees & timings. There is a difference in the price of tickets as well. Highlight – A true shopper’s paradise. It showcases the best from each state. The participating agencies especially the Government run outfits bring some of their best products. Usually these can be bought only during the Trade Fair or at select exhibitions. It is also the best place to catch the cultural extravaganza of traditional dances and costumes of every State. Insider Tip – It is possible to bargain, there is a discount for wholesale meaning if you are buying bulk products there is a discount. It is very very crowded especially on Saturdays and Sundays which are infinitely avoidable. It is ideal to reach early both during Business Hours and General Public hours when it is less crowded. It starts to get crowded after 2:00 pm or so. Foreign pavilions attract more visitors and are more crowded. Be careful with your belongings. Ideal to pick up Organic Spices, Exotic juices, clothes and good bargain buys. Matka Market as its name suggests is a market for pots and is located near Sarojini Nagar, a well known thrifty market place. Markets for Matka or pottery dot all Delhi neighbourhood. Indian pottery comes in various hues, sizes and colours coupled with a host of techniques to make them. Jaipur blue pottery, Kagzi, Manipur black pottery are some of the ones which spring to mind not to mention the Khurja pottery which has made a name in itself. So a mention by someone close of a market for pottery near S.N.Depot (Sarojini Nagar Depot) on the way to Chanakyapuri pickled my interest. The market’s presence was reiterated by my parents who had bought plenty of “martbaan” - the pickle jars, bowls in various sizes so famous from North. They further added that it was made at Gwalior potteries, the huge compound which once churned a lot of pottery / ceramic ware. My research on it and its product, whether it is still being made is on the “must do” list. My parents though weren’t sure if with all the changes in Delhi, the market and its potters were still there. The potters used to sit in an inside lane on the back wall of the compound of Gwalior pottery and sell beautifully finished hand glazed ware. Many of the pickle jars, bowls that we use at home were procured from here. So armed with so much information I set out in search of the martbaan sellers. The market is there alright but the martbaan was sadly missing, which was a bit of downer for me. Going with a prefixed notion has its pitfalls. Anyways the range is not so bad, quite good and reasonable. It is more towards terracotta – pottery for the garden and home, possibly this sells more than martbaans. Who does make pickle now?? It is bought off the shelf!!! So there is plenty to choose from, terracotta Bankura horses, wax filled diyas, figures of Ganeshas, lovely garden pots – mural like vases, bells, hanging ones, chimes..….. of course Matka – possibly the name Matka market. My trip immediately after Diwali might have been the reason for the hangover of Diwali items! The prices - very reasonable. Another disappointment, the shops simply sell what is made elsewhere. There are no potters – so one cannot see what is being made. I did not enquire about the “martbaans” or Gwalior potteries, am planning to do so on another visit, which of course means another post! Location – In a bylane on the road towards S N Depot – Sarojini Nagar Depot. To be precise on the Ring Road turn in to the right at the Bhikaji Cama Place crossing, simply follow the road and you can view the market on your right. It is opposite to the petrol pump next to the bus stop, near a school run by the Government. The lane is visible from the main road with pots piled high. Behind Gwalior pottery. Timings – Open all days, morning 10:00 am onwards. The sellers also have their homes there. Highlight – The range is pretty good and it is possible to make products on order. The range includes tortoise shell plant holders, tortoise shaped piggy banks, multiple pots, matka, bird baths, diyas filled with wax, figurines of Gods & Goddess….with good stock quantities. Painted ones are also available. It is ideal to pick up pots for the garden and bird baths. Insider Tip – It is possible to bargain, there is a discount for wholesale meaning yes if you buy more number of pieces, it is possible to strike a better bargain. The prices are quite nominal. The road is nearly empty and is ideal for quiet browsing. In another otherwise traffic filled Delhi, it is peaceful with nice wide roads and interesting browse. The emporium complex at Baba Kharak Singh Marg was designed to showcase the craft, culture, cuisine and tourism of the various states. So Emporium or Baba Kharak Singh Marg is a favourite haunt for many as nearly all states of India and Union territories have their respective showrooms. Recent additions have been Goa, Uttaranchal, Chattisgarh, Jharkhand and Mizoram all on the top floor of the Rajiv Gandhi Handicraft Bhawan. Their showrooms are just taking off, though there is a plethora of craft items in them. The emporiums are all run by the various state Governments and not by private individuals. Thus the products are genuine as most emporiums source it from artisans or craftsmen groups. The Emporiums traditionally sold craft items from their particular state. Though now it is not uncommon to find Kashmiri shawls in a non shawl producing state or jewellery from Rajasthan in another state. There was a time earlier, when the states vied with each other for the offering, now though this has considerably declined. However, one can still pick up some genuine and beautiful pieces from the respective state and Union territories. Each of the state has its tourism information centre above the emporium. The Delhi state emporia has an interesting array of toys, Kerala – bell metal works, The Andhra Pradesh Emporium good fabrics…. There is an array of interesting products. Location – Located in Connaught Place, Opposite Regal Cinema & Hanuman Mandir. Timings – The Emporiums open at 10:00 am and close by 6:00 pm – 6:30 pm. Parking is available at the back of the complex and the front side. Alternatively park in Connaught Place inner circle and walk it. It is fun. Highlight – It is possible to see the offerings from various states in one place. The Emporiums are mines of information of products made in each of the state. Insider Tip – It is best to avoid the place in the afternoon when all Emporiums close for an hour’s lunch. Especially the time between 1:00 – 2:00 pm. The prices of some products are very very reasonable while some exceedingly high. The festival season sale – Diwali or year end is an ideal time to pick up bargain buys. Some items can be discounted at more than 50%. Earlier the shops were highly bureaucratic and staid a reflection of the Government running. But now there is a definitive change and the employees are friendly and genuinely want to sell. Most emporiums keep getting new stock through out the year, one can ferret out interesting products. Try the Rajdhani restaurant or Bikanervala for good food after a shopping binge! The South Indian coffee aka filter coffee or kapi – is a die hard South Indian addiction, not easily given up even when kilometers away from homeland. For South Indian filter coffee fans, each has its pet style and theory for brewing the heavenly decoction. Of course, there are plenty of places to drink (which will be a part of another log), there are some excellent joints to buy filter coffee powder and brew it in style to your taste at home. The easiest way to get to a filter coffee powder shop is by using one’s powers of smell. And it does beckon when coffee beans – Peaberry, Arabia or Robusta is roasted slowly to perfection – light, medium or dark. 1. Coffee Board outlet – Behind Scindia House – in Janpath Lane. Just follow your nose to the smell of fresh coffee powder being ground. They also have other outlets. 2. Devans South Indian Coffee & Tea (P) Ltd, a little shop tucked into a corner market at Lodhi Road market in New Delhi. They offer customized grinding. One can give the combination of coffee powder to chicory, roast and of course the beans. 3. Veeramali near Lajpat Nagar who is used to sell roasted beans which can be ground at home. I am not sure if the shop is still around. Highlight – Do visit these shops for at least the experience of smelling the invigorating smell of coffee, if making filter coffee is cumbersome. Insider Tip – Learn to brew coffee from Devans. He also has a huge collection of quaint coffee brewing accessories on display. The right way to make coffee I am told is to heat the milk, sugar, water decoction to boiling point, pour in the filter coffee decoction, full flame, near first boil and turn off the heat. The trick not to heat or boil the decoction – it does work well for us! St. James Church was the first church to be built in Delhi and has been witness to history unfold. A symbol of Thanksgiving built by James Skinner it is a beautiful example of early 19th century architecture, a harmonious blend of the colonial and Mughal styles. The building of the church was a fulfillment of a vow made by Skinner when he and his men lay wounded in the battle fought for the Karolee Raja against the Onreah Raja in 1800. Suffering in pain, he is supposed to have made a vow that if he were to survive this wreck, he would build a church. He was saved and fulfilled his vow. The work on the Church is supposed to have begun in 1823. In 1836 Bishop Daniel Wilson consecrated it naming it after St. James. Skinner’s Horse, a force he created is still a part of the Indian Army. Location – At the busy crossroad of Kashmiri Gate. Down the Daryaganj Road at the far end. Approximately 8 – 9 kms from Connaught Place. Timings – Open for Prayers Sunday morning. Otherwise one has to speak to the caretaker or the authorities to be allowed inside. Highlight – Recent has been the restoration work by INTACH of the dome, parts of the building and the stained glass windows. Ratish Nanda, conservation architect has been instrumental in the project. The cracks in the dome with iron rods which had rusted were replaced bit by bit, with fabricated steel rods. Also over time cement had been used to seal the cracks, all of which was removed and replaced with lime plaster. Insider Tip – Go there on Sunday mornings. The entire area is very quite, peaceful, no traffic and there is absolute calm. Inside the church the stained glass windows are breathtakingly beautiful, they were also part of the restoration process. The ones flanking the altar depict, the Crucifixion and Ascension, while the third terrified soldiers at Jesus Christ’s resurrection. The sight that greets one on entering the church is a picture of serene tranquility - of the beautifully carved altar with two magnificent stained glass windows flanking it, the dome shaped ceiling supported by huge pillars, the old organ, the lectern and the pulpit. 1. Computer & computer related products – all kinds hardware, software, computer peripherals, accessories...and anything else related to the electronic gizmo world is available here. All top brands have their showrooms here. In the unbranded era, this was the ultimate place to pick up an assembled computer and it still is. Almost all parts are available at rock bottom prices. One has to hunt though with a wide eyes and ears! It is the unbridled king of software. Everything that has been ever developed is available. Even without bargaining one can get a price difference of 10 – 20% easily. 2. Excellent (DTP) Desk top processing operators. It is ideal place for DTP work. 3. Fabrics, Accessories, Laces and more… Another interesting aspect which developed was the traditional cloth merchants from the Chandni Chowk area migrated to this place to cater to the export market. 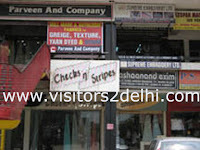 Most of these shops are located at the far end of Nehru Place towards Mansarovar Building. The variety of fabrics available is mind boggling. Handloom, powerloom, mill made jostle for space offering tussar, silk, cotton, georgette, prints, crepes… The offering follows international trends. 4. It has a couple of old book shops and dealers. 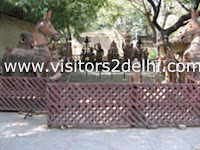 Location – It is located in South Delhi and is at a distance of about 20 odd kms from Connaught Place. A left turn from the Moolchand Flyover and a straight drive beyond LSR (Lady Sriram College) will deposit one just in front of the place. Timings – The place is closed on Sundays. The best time to be in the place is after 11:00 am when the place swings into action and closing late after 7:30 pm. Parking lots are designated all around the place - is extremely problematic and requires much grit!! Highlight – With some computer related items these are available at nearly 50% of the prices available in showrooms, as long as you know how to bargain it right! No, these are not fakes, it is possible to get a bill with warranty. It just works akin to a wholesale market. Well connected with Banks, Post Office and houses good many businesses. Insider Tip – This place is ideal to ferret out good fabrics and excellent bargains in computer & related accessories – as long as you know what you want and cannot be mislead on it. It is not the cleanest of places, just brave the exhaust fumes of gensets, smell of food being cooked, touts selling their ware on the footpath, it opens up a new world. It has some extremely affordable, delicious places to eat. Almost all the eateries serve good food. The Swaminarayan Akshardham temple on the banks of the River Yamuna is a wonder of sorts. It is actually with awe that one realizes that the temple which could easily be mistaken for an ancient rock cut edifice from the Indian history is a modern 21st century making. – 2005 to be precise. The temple in brief can be described as a summation of history, beliefs, ideals, tenets & occurrences of nearly 10,000 years old Indian culture curated and exhibited under one roof. It will be simplistic to call it one roof as the temple spreads around a total of 30 acres and the lush garden spreading another 60 acres. The name Akshardham means eternal and abode of the Divine. It is as one looks at the gigantic dome arising into the sky, one is transported back into time, the hustle and bustle of the street outside is a distant dream. It takes some momentous time to take in all the sites – the structure using red, pink sandstone from Rajasthan and white marble, the beautiful almost springing with life carvings. Each expression caught to perfection, it is inspired by the Nagara style of Temple Architecture, traced to the 5th century. What makes it attractive is the wonderful combination of materials, symbols and aesthetics. Each flower carved, each panel, each stone animal or figure of God, Sadhu (ascetic) or holy men carved has a meaning behind it - which is symbolic and philosophical. Location – It is an approximate distance of 15 kms from Connaught Place. It is just across the bridge over the Yamuna river. Had the river Yamuna flowed through in its pristine glory, the sight across the river would have been an unforgettable one. One can see the temple from afar. It is on N H 24, Noida Mor. Timings - 10:00 am to 7 pm (April- Sept) and 9:00 am to 6 pm (Oct. – March), Night lighting on Saturdays and Sundays. The temple is closed on Monday. Entry is free though there is a small charge to view the two exhibitions and large format film. No electronic cameras or cell phones allowed inside. Parking space is substantial. Highlight - For the purpose of records, the mammoth temple is 141 ft high, 316 ft wide and 356 ft long. It has a total of 234 ornately carved pillars, 9 ornate domes, 20 samvarans (crowns), four entrance doors, intricately carved outer wall and two plinths, the awe inspiring Gajendra Peeth and a total of 20,000 statues of great devotees, asetics and acharyas of India carved on it. Insider Tip - One needs an entire day to see the place thoroughly and can still come back dissatisfied. The food served at the inhouse restaurant is wonderful The souvenir shop stocks interesting products including handicrafts – good embroidery and beadwork, and organic products – honey, tea and more. The name Paranthewali Gali says it all, yes it is one lane where one can get stuffed with the breakfast fare of paranthas throughout the day. Can paranthas be so famous to be eaten at anytime – lunch, brunch or dinner – you wonder? But the crowds don’t think so and once you taste the paranthas, well even you won’t think so either! In the busy by lane of Chandni chowk are the parantewali shops. In earlier times when Chandni Chowk was a must visit for anyone, it boasted of about 16 shops selling nothing but paranthas today it is down to a 4. Never mind, the fare is still its pristine best, though old timers, my parents included swear the size of the paranthas was definitely bigger than what it is today! 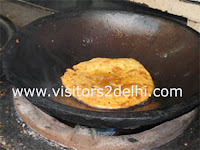 The paranthas are still made traditionally and shallow fried in pure “desi” ghee. The range – from the ubiquitous aloo (potato), gobi (cauliflower), gajar (carrot), methi (fenugreek) to the more exotic papad, rabri, mixed vegetables, karela (bitter gourd)… the price from an affordable Rs. 25/- to Rs. 40/- per parantha. It is value for money as it is accompanied by a couple of varieties of subzi, chutney and salad. Location – Chandni Chowk is located next to the Old Delhi Railway Station, at an approximate 4 kms from Connaught Place. Turn in left from the turning in front of Kanwarjis sweet shop on the main road. Timings – Open throughout the week, about 9 am in the morning to late in the evening. Parking at the MCD parking lot and from there walk it to the Gali. Rickshaws can be seen only on Sundays. The rest of the days, it is banned on the main road. Highlight – Almost all the paranthas taste good, wrap up the binging on paranthas with imarti or kulfi at Kanwarjis at the corner. The subzi accompanying the paranthas are again typical old Delhi fare so one can come across the rarely seen pumpkins, jackfruit variance as also typical chole, paneer fare. Insider Tip – The paranthas though made in ghee rest easy on the stomach and are very light and filling. It is very easy to loose count of the number of paranthas polished off, what with the makers gently coaxing saying try another piping hot one, “you have not tried the mirchi or methi one, it is good”!! Ideal hogging for the warm winter months. Garden of Five Senses, at Said ul ajaid, the heritage part of Mehrauli truly awakens the five senses. Yes - sight, touch, sound, smell and taste. The garden is beautifully planned, designed and maintained more as a prayer and ode to the maker for the gift of five senses we possess. The garden has aspects, which evokes each of these senses taking one beyond the real physical world to a dream like float of bliss. With Qutab Minar playing the backdrop at a distance it evokes dreams of a distant past. Spread over 20 acres, the architecture blends superbly with the ruins of Mehrauli. The stone columns, pillars, seating arrangements, amphi theatre all bring out aspects of architecture from Delhi’s historical past. The use of stainless steel in limited manner blends in the contemporary. An ideal blend of tradition with the modern is this project of the Delhi Tourism and Transport Development Corporation. The ambience is one of simply doing nothing. The restaurants at both the gates offer spiced up products, the designer shops offer enough excuse to browse through and shop. It buzzes with activity during various festivals. Location – Said Ul Ajaid, Saket. Turn in to the left as you come down the IIT crossing, just before the statue of Mahavir at Ahimsa Sthal. Then the first right in, there are directions all along. Follow the road to reach the Garden. Timing – Open from 8 am to 8 pm on all days. Tickets – Rs. 15/- for adults, Rs. 10 for children (ages 3 to 10) and senior citizens. Plenty of space is available for parking. Parking cost Rs. 10/-. Highlight - The installation by Kristine Michael, John Bowman’s tree, Enaz, Subodh Kerkar, Radhakrishnan..stand out as the Mughal era inspired char bagh style of garden. Try identifying the various trees - The kadam wood trees, camphor, pine, teak, rudraksha, kalpavriksh, kamandal…. The Trail of fragrance, appropriately named, appeals to the sense of smell. The aroma of champa, chameli, lavender, raat ki rani, rose and marigold is wonderful. Various varieties of palm can be seen. The bamboo garden houses a variety of rarely seen bamboos like black, green, Buddha and dwarf. Insider Tip – The best time to visit is day time to catch the sun in winters and late evening in summers, when the ambience and the breeze is a welcome change from the furnace like environs of Delhi. In the evenings, the fountains work and with the dimmed light around, it is truly another world. The food including Fruit Beer, is welcome, though is a deservingly another blog. Public transport is not available so please be sure you have a vehicle to ferry you to and fro. For the conservative, “the romance in the air” can be irksome!!! The drive from the road to the Garden is beautiful and sets the tone to what is to follow. This religious place, a must stop for pilgrims is located on the Purana Qila Road, strategically next to the Crafts Museum bang, on the main road. While traversing this road, before the Delhi zoo, one can see a tree with plenty of pots hung inverted. These are offerings made by devotees whose wishes have been fulfilled. For the followers irrespective of their religion, believe that all “mannat” done with a pure heart are answered. Buses carrying loads of pilgrims stop here for the blessing and where followers make their offerings. Others simply walk in for a quick prayer. The Matka Peer Baba is actually called Hazrat Sheikh Abu Bhakar Tusi Edri Kalandari Matka Peer Baba. The saint came from Iran and possessed miraculous powers of healing. And it is to this date that believers hold to this faith. In the event one’s prayers are answered the offering is a matka, yes an earthen pot made by the humble potter. Location – On Mathura Road, at the corner of the turning to Bhairon Singh Marg. Timing – No fixed timings opened throughout the day. Parking can be done in the Bhairon Singh Marg lane. Highlight - At the foot before the stairs, one can buy the offerings or chadawa. It is two thalis (plates) of offering containing - fragrant rose petals, incense sticks and sugar coated offerings. The thali is sold as a pair. This is placed at the Dargah upstairs with the covered head with a cloth. The incense sticks are lit in a separate place meant for it. Insider Tip – The musicians belt out harmonious melodious music, which literally transports one to another world. And it is difficult to believe that one is in the same mad metro. Though the shops below sell only indigenous sweet smelling rose petals as opposed to the export variety one gets everywhere in the market, somehow it smells even more wonderful here. It is this heady smell of roses which greets one at the entrance. One thing that stands out about Delhi, is its concentration of communities in particular localities. So Chittaranjan Park true to its name has a concentration of Bengalis or Bongs to be short. And the market an ideal sourcing ground for all things from Bengal – jhalmurs, shingaras, Mughlai paranthas, lovely cotton clothes and more…. There is another Part I market well it does deserve another separate blog. The market wears the most festive look during the Durga Puja. It is beautiful to see miniature idols of Saraswati, sold for the puja before Basant Panchami, in her finery bedecked and divine. It has the usual signs of modernity with branded franchise shops, ATM centres in their swanky “spot me a mile away” design. The flavour of the market is through the small shops which can take the nostalgic back to Kolkatta. For clothes especially sarees.. more and more cotton, silk…dhotis is Rama Krishna Bastralaya. Actually my parents, though the credit for discovering the shop in its earlier avatar in Gole Market goes to my father, have patronized it for years. The quality of the cotton is good, majority is handwoven and the colour does not run. The range includes – Jamdani (pure and jacquard versions), dhonekali, Tangail Dhaka, Dhaka jamdani, Mysore silk and more….it is a pleasure seeing the crisp starched cotton beautifully stacked. Aananda opposite to the market offers an excellent range of eclectic ethnic creation. Another well known eating outlet which locals swear by is Dadu’s Cutlet – offering vegetarian Shingaras (samosas), Mughlai paranthas, fish cutlets, fish chops…(being a vegetarian I have just tried the shingaras and egg paranthas both wonderful!) at very affordable prices. Timing – Closed on Tuesdays. Parking on the road, quite chaotic. Prone to terrible traffic jams from 6 pm onwards and in the morning. The market comes to life in the evenings and is quite dull in the morning. 4 pm onwards is an ideal time. Insider Tip – Dadu’s Cutlet opens in the evenings by 5 pm or so and makes only limited number of each item. He is sold out by 7 to 7:30 pm. His morning fare includes lip smacking Puris, Puchkas... Literally the early bird gets the worm!! Ram Krishna Bastralaya brings in new stocks in summers and before Puja (a month and a half before), however there is a good range throughout. Shopping in Delhi is fun since it offers a host of options from the luxurious to basement bargain category. What is also surprising is that some very good value for money offers can be found at some of the top markets of Delhi. One such is the GK – II (Greater Kailash Part II ) market. Earlier this was prime space for commercial establishments, especially ad agencies and banks, today these remain but along with it has sprung some excellent shops incorporating some big names. The market is an easy to maneuver H shaped one. A lackadaisical place, its sudden metamorphosis resulted in a number of good restaurants, interior design shops especially floor tiles, kitchen, bath, tile varieties, furnishing, fashion and fitness & health centres. Both Nalli and Art Karat make their presence felt as Talwalkars and Kaya Skin Care. It is for kitchen bath the range is venerable including Kohler, fcml, Pergo, and a host of shops selling imported (Spanish, Italian floor tiles, bathroom concepts and more..). It also has some fine restaurants – China Garden, Chungwa, Ritu Dalmia’s Diva, Ruby Tuesday, Flames to Not just Paranthas, Nathu, Barista, Café Coffee Day, …. A far cry from the days when Anupam was the only restaurant. The only problem in tracking restaurants here is that many start fancifully to close down or move to another line of business. Timing – Closed on Tuesdays. Parking available at Rs. 10/- for cars and Rs. 5/- for two wheelers. Parking is plentiful though choc-a-block full. Restaurants open early especially the cafes while those serving lunch and dinner open during the serving hours. Highlight - If you are looking at doing up the home – floor, bathroom…this place provides some excellent option and not all heavy on the budget. The shopkeepers & staff do offer sound advice and pocket friendly options. Though discounts are galore. Nalli has excellent range of cottons. About 8 – 10 banks operate as also some well known media companies. Insider Tip - Sunday is a nice day to visit as all commercial establishments are closed (there are a host of banks) so parking is easy. The choice of restaurants is dizzying offering an excellent spread. 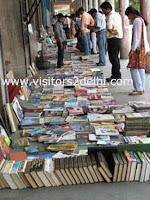 A book lover’s paradise, is how one can term this Sunday book market which is laid out on the pavements of Daryaganj every Sunday morning. From quiz books, old guides, GMAT, GRE books, Engineering books to fiction, pulp, romantic novels and of course coffee table books. How low are the prices? Well basement bargain – books available for as little as Rs. 10/- the only condition, one would have to weed through the mountain to come up with one’s favourite titles. Others range from Rs. 20 to Rs. 200 or more depending on the title and if it is imported. The sellers don’t mind if you weed through the books for sometime and leave without buying. (I often don’t). The book sellers are friendly and offer plenty of tips, advice and even directed me to the shop when I wanted specific titles. If it is not available just request the shopkeeper and he will help you get it. I did lay my hands on some beautiful old rare textile books and fiction (PG Wodehouse). Location – The market starts on Daryaganj – one branching on the Golcha cinema stretch towards Old Delhi. It occupies a near 1 km stretch here. The other winding inside the first left hand turn after crossing Delhi Gate on Darya Ganj, into Asaf Ali Road. . Timing – 6:30 – 7 am to 7:30 – 8 pm in the evening on all Sundays provided there are no restrictions from the authorities. This congested area is empty on Sundays when all establishments are closed. Ample space and parking is a breeze! Highlight - It might be a flea market, but it is organized no doubt, most shops specialize in their offerings. Call it second hand, third hand or even first hand, the find is exhilarating! Insider Tip - The trick of the trade – a full fledged breakfast, it does provide sustenance to weed through the books and go on to the next vendor with equal enthusiasm. The other virtue - patience to sift through the books. After the search, though there is plenty for fortification – Moti Mahal’s food, ubiquitous juice wallah – Raj Juice Corner for milk shakes and fruit juices, banta seller’s, Bisleri, Fanta and other cold drinks to the Chole Bhature dhabbas…that is another foodie story though!!!. 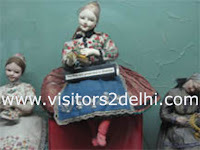 Ever want to relive your childhood – visit the Dolls Museum (Shankar’s International Dolls Museum). It transports one back to naïve times of fun and is rejuvenating. Visit with someone who is equally fascinated with dolls, well it is great fun. One can get the history of the place from the Museum itself. To put it simply, it is one man’s love for dolls – yes, K. Shankar Pillai, well known cartoonist, Editor of Shankar’s Weekly and founder of Children’s Book Trust (CBT) was gifted a doll by the Hungarian ambassador in early 1950. He loved it so much that he began seriously collecting costume dolls from various countries he visited. Today, nearly 4000 dolls are on display representing 85 countries. It is the world’s largest collection of costume dolls. Some beautiful pieces belong to the erstwhile Eastern Block. The beauty of the costume dolls is such that it transcends time barriers. What is more attractive is the hand embroidered costumes of the dolls. Each dress detailed to perfection to the last T. Incredibly beautiful, I have spent hours soaking the textile range in! Location – On Delhi’s fleet street – Bahadurshah Zafar Marg. About 4 kms from Connaught Place. Timing - 10 am to 6 pm (the ticket counter closes at 5:30 pm). The museum is closed on Mondays and other holidays. Parking is difficult or can be done across the road. Highlight - Some of the prized dolls include the Kabuki dancers of Japan, Boys Festival and Girls Festival of Japan, Ten pairs of aborigines from Australia, Indonesian dolls….. many received as gifts from visiting dignitaries from the Madame Tito, Queen of Greece to the late Mrs. Indira Gandhi and Mr. Rajiv Gandhi. Insider Tip - The museum has its own workshop which produces dolls for collectors and connoisseurs. Do visit the book shop also. The Udipi Hotel sells some tasty fare as also the food shop in the subway and a couple of street food vendors of naan / chole. A second hand furniture market is an antique furniture collector’s paradise. Antique furniture buying through a dealer is interesting, the fun though is poking around in a bazaar like atmosphere with the hope of unearthing an unusual piece. And if stocks keep arriving at the place, the thrill increases. In India, where furniture making has been influenced by the Colonial, Portuguese, Dutch and of course Mughal and the various Indian rules, this market holds out a lot of promise. In my sojourns I have come across consoles, almirahs, bookshelves, ottoman, munim desks…..and more line the road, inside the shop which are perched higgledy piggery. As most dealers tell me again and again that the pieces have been sourced from all over the country – Goa, Kolkata (Calcutta), South or are salvaged from estate sales, embassy auctions and more. The entrance to the market is itself lined with shops where woodwork is on in full swing. The market has 25 – 30 shops run by veterans who have been in the profession for a long time. The atmosphere is thoroughly laid back with no persistent sales push, screaming but a general peaceful calm, giving the buyer ample space to browse through. Apart from the antique pieces, the shopkeepers revel in making reproductions and the range is truly remarkable. Any furniture photograph and it can be replicated to perfection. Location – Located behind LSR college in Amar Colony. Near the Lajpat Nagar nullah or drain from the Ring Road. Timing - The market is open on all days – 10:30 – 11 am to 7:30 – 8:00 pm. Parking is literally on the road or in a bylane. Highlight - The shopkeepers can also help you locate or procure a particular style or period piece. Most shopkeepers have their team of carpenters, polishers, painters who are master restorers. They excel in reproductions. Insider Tip – The market comes alive on Sundays, when regulars, celebrities descend to hunt for bargains. The shopkeepers are honest and work on a decent commission and the "whopping discount bargaining" is absent. It is easier to get a reproduction made as antiques are difficult to come by and given the lack of space, everything is not displayed. There is no process for dating so it is not possible to know if a piece is a true blue blood antique or vintage or just looks old. 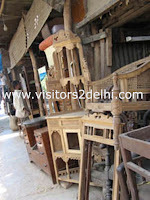 (To buy our Delhi Directory of Furniture dealers with 25 plus names of dealers / shops / boutiques/ craftsmen in and around Delhi dealing in old, vintage, antique, look alike antiques, furniture in beautiful wood email us at visitors2delhi@rediffmail.com. Each of the person has been carefully chosen and are well known in their fields be it as craftsmen or dealers). 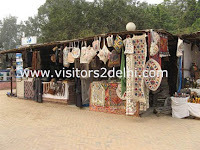 Dilli Haat is - a wonderful marketplace for handproduced items. It lives up truly to its name - yes Haat pronounced (haaa t – as in tap) means market place in Hindi and stands to translate as market place in Delhi or Dilli Haat. Haat is usually used to describe weekly markets held in rural area. This was the concept in the design of Dilli Haat, to create a place within Delhi where people could buy products straight from the maker – craftspeople without any middle man. Dilli Haat has been innovatively designed and actually covers a very old sewer drain. It is an ideal place to see the panorama of handwork – textiles, jewellery, tribal paintings, sculptures, wood work, metal craft, silver craft …..from the country. I am a huge fan and am there literally once every 10 days (the earlier 15 days for each craftsman has been revised to 10 days keeping in mind the popularity). It is also an ideal place to buy organic products, natural herbal cosmetics, honey, farm fresh products… There is a change of craftspersons every 10 days. Some of the well known exhibitions to look out for are: Master Craftsman creation – where only National Awardees participate – this is held in the first half of December, Dastkar – Nature Bazaar – 2nd half of November, Dastkari Haat Samiti – End December (towards Christmas & New Year), Uttaranchal Organic Festival and that by Tribes (first half of February). One can find some good craftsmen through out the year. Timing – It is open 10:30 am to 10 pm on all days. There is an entry fee of Rs. 15 for adults and Rs. 5 for children (Ages 5 to 12). Children below 5 are allowed free inside. Parking is at an hourly rate of Rs. 10 and there are two lots behind the Haat. Though very cumbersome on a holiday. It is wheel chair friendly. Highlight – The range of products is very interesting. Almost all handcrafted products from India are available from time to time. Some of the craftsmen supply to leading branded stores in the country. One can get good quality kantha, tribal textiles, tribal paintings, Lucknowi Chikan, Pashmina, metal work, silver… The restaurants offer good quality food from all over the country at very affordable price. Insider Tip – Most craftsmen open the stalls by 11 am only. Best timings are 12 am onwards in winters, in summers evenings are better especially when accompanied by cultural programmes. It is a good sourcing ground for those who want to buy craft pieces in bulk for business. Bargaining is the norm. Craftsmen who are National Awardees do not fall into the bazaar like haggling for their products – rightly so as they are acclaimed artists in their particular sphere. For others though, bargaining is vociferous and prices can be bargained to nearly 40 – 50% of the quoted price. Enquire persistently for upcoming shows, there is little information available and one can miss out on good events if not alert!!! 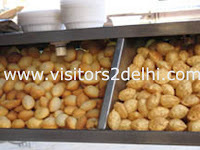 Snacking in Delhi is synonymous with eating Chaat. It is almost never made at home and popularly eaten off the streets! In Delhi almost every market small or big has its share of chaat vendors or wallahs. Roughly chaat can be described as vegetarian snack food from the streets. The delicious range includes a host of food snack items, but to the North Indian majority in the Delhi area, it is the, aloo tikki, aloo chaat, papri chaat, gol guppa, dahi bhallas, dahi pakoris, dahi gujiyas, bhalla papri, raj kachori, luchha tokri which comes under the chaat nomenclature. Chaat literally means to lick yes and the fare is lipsmacking. It is crisp, tangy and brings out a variety of sensation, literally putting the tongue on fire. The chaat combines all the flavours – salt, sweet, hot, sour and cool into a homogenous blend. Such that each flavour flows distinct yet it blends as one. Giving it a unique taste which is best eaten and not described. The commonality of all chaat is the seasoning used – the khatti meethi (sweet sour) chutney (sauce) called saunt, mint green chilly chutney, green chilly chutney, green chillies, coriander leaves, rock salt, boiled potatoes, chick peas boiled and the chaat masala (spices). The range of seasoning varies from shop to shop which gives each its unique taste. Gol guppas or pani puris are small round crisp fritter like puris filled with a mouthwatering combination of tamarind water and more. Aloo tikkis - Potato cutlets filled with chana dal (lentils) or green peas and spiced up. It is shallow fried on the girdle. Aloo Chaat – Cubes of potatoes deep fried in oil on the girdle. It is served liberally sprinkled with rock salt, lemon juice, chilly powder…..
Fruit Chaat – A spiced up mixture of freshly cut fruit. Highlight - Chandni Chowk almost all shops are good for chaat. Chaat served at each corner is different. So popular is Aloo Tikkis that McDonald launched aloo tikka burgers! The aloo chaat in its pristine form can give French fries a run for its money. Location - Where to Eat – Bengali Market near Connaught Place houses – Bengali Sweet Corner, Nathu. Most shops there serve chaat worth their name. Eatopia at India Habitat Centre is a modern restaurant serving street food. Timing – Most shops open at 10 in the morning and serve it late into the night till stocks last! Being street food it is a steal - priced from Rs. 10 per plate to about Rs. 30/- depending on what is ordered. Insider Tip – There are no bad outlets selling Chaat. One cannot go wrong with a random pick. The origin of chaat is traced to finding a cure for stomach ailments, however an overindulgence of chaat can result in upset stomachs. A sore throat is also not unusual after a binge. Golguppas made from semolina are better than the ones from wheat flour. When eating gol guppas, check if the water is Bisleri, or water is of assured quality and ice used is clean and it is served untouched by hands. The National Museum is the "prima donna" of all museums in the country. It unfolds a fascinating account of the 5000 history of Indian Civilisation from the Indus Valley Harrappan Civilisation dated to (2500 BC - 1500 BC) to objects till the 19th century. The 2,00,000 plus artefacts in its repertoire has been put together from excavations, donations, buying from antique dealers and those in the possession of the Government. However, less than 1/3rd of the objects are put on display. No pieces from the end of the Harappan Civilisation (1500 BC) to the 3rd Century BC have been excavated so far, hence there are no displays for this period. The Museum has some of the finest pieces of Bronzes, Mauryan Art (the Mauryan Period 3rd Century BC). Two pieces stand out - the Mauryan Head and the ring stone. Described as outstanding pieces of stone work with the characteristic Mauryan polish. Jain Philosophy, Buddhist icons, the Kushana period pices.... The Museum also has an outstanding section on manuscripts, coins, pre-Colombian art, jewellery, ivory carving, silver pieces. The textile collection is ecelectic in its limited space. From icons, sculpture, paintings, writings.... it is gloriously spread over three floors. Location - Far end of Janpath next to Vigyan Bhavan, just 1 km or so from Connaught Place. Timings - It is open 10 am to 5 pm - Tuesdays to Sundays. Monday is closed. Entry fee is levied which is Rs. 10 for Indians and Rs. 150 for foreigners. Photography is allowed, camera fee Rs. 20 for Indians and Rs. 300 for foreigners. Insider Tip - Wear sensible walking shoes as the exhibits are spread over a large space. Some of the exhibits are timeless and it is hard to believe they were crafted centuries ago like the Saraswati at the foyer. Most of the Department heads possess wonderful knowledge on the collections, history, collecting in general and also specific nuances of each period. They are accessible and proud to explain the pieces and nuances of the various craft especially jewellery and textiles. The National Museum of Handloom & Handicraft popularly called the Crafts Museum. For those of you passionate about handmade products - crafts some of which is so tedious and fine that it becomes an art literally - this is a definite must see. Paying tribute to the artistic mastery of the Indian craftsman, it is a kalaidescope of craft available in the country. Housing some of the finest collection of handcrafts from across India. It has an approximate collection of 22000 pieces. Outstanding is the collection of folk art - handpainted traditional paintings, tribal art & textiles. Handpaintings include Chitrakathi, Phad, Cherial, Kalamkari, Madhubani, Orissa Pat paintings, palm leaf paintings...the collection of cultic objects, toys & puppets, tribal art, household utensils is another highlight. The huge chariot, windows from old homes adds to the picturesque charm of this Charles Correa designed Museum. The textile collection upstairs truly encompasses the weaves, embroidery from across the country. It is a one stop place for craft enthusiasts. Be it in jewellery, textiles, woodcarving, painting... Though located on a cross section of a busy road, it is a literal far from the maddening crowd. Location - At Pragati Maidan, Bhairon Singh Marg, opposite the ramparts of the Delhi Zoo. It is roughly 3 kms from Connaught Place. Timings - Entry is free, it is open 10 am to 5 pm - Tuesdays to Saturdays. Closed on Mondays but live demonstration by craftsmen is open on Mondays too. Highlight - The live demonstration by craftsmen in the open thatched exhibition area together with a folk dance performer. Insider Tip - New craftsmen come in at the beginning of everymonth. There is a change in the craftsmen and craft demonstrated every month. You can at times get products handmade in front of you. All particpants are craftpersons specialists in their field, though now the selection is not what it used to be. Prices are reasonable with a fair bit of bargaining. ITPO (Indian Trade Promotion Organisation) Pragati Maidan also holds many exhibitions as also that at the Handloom Pavilion. These are held inside Pragati Maidan. One can always hop across to catch these. Do enquire persistently around as signboards are not easy to come by. 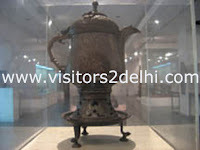 Delhi has plenty of Museums to choose from - the Government run Museums & Library, to private collections and museums which can be visited by special appointments. They span a host of interest from technical to the general from specifics of hobby - textiles, stamps, dolls to the more general ones...a quick dekko (peek) with highlights of some well known ones, others not so frequented as we go along. To the uninitiated, Delhi is a global village where surprising the traditional exists in perfect tandem with the contemporary and uber modern. It has something new, everything borrowed literally from the people (who have migrated from everywhere), power, water and more…. It is steeped in history, each rule has shaped this city added its bit to the architecture, food and fashion. From step water wells, forests, tracts of green space (though fast depleting) forest like, spiritual sojourns, countless museums housing some memorable pieces to modern shopping arcades, cuisine from the world and more….. Where the art of haggling or bargaining comes of age…learn of the insider tips, places to see in visitors2delhi.